Despite the puns in the title, electrical safety should be of serious concern in your home, and very few are up to date on safety recommendations. Despite the advent of many wireless choices in electronics, the number of wires in our homes keeps increasing, fighting for space on full power strips. In fact, that’s a great place to begin. No, not the main thoroughfare in Las Vegas – I mean that dusty stick with a series of electrical outlets which may or may not be plugged into another power strip somewhere along the line. 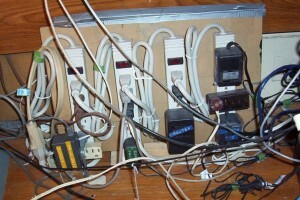 Certainly, overburdening a power strip is not safe, and although some power strips have a built in surge protector in case of an overload, one should be advised that trusting your home and family’s safety to a $9 power strip is a leap of faith too far. Entek HVAC Company can help. Our professional electricians can add any number of safe outlets in your home, thereby reducing the risk of an electrical mishap due to those abstract collages of wires lurking under desks and behind televisions. 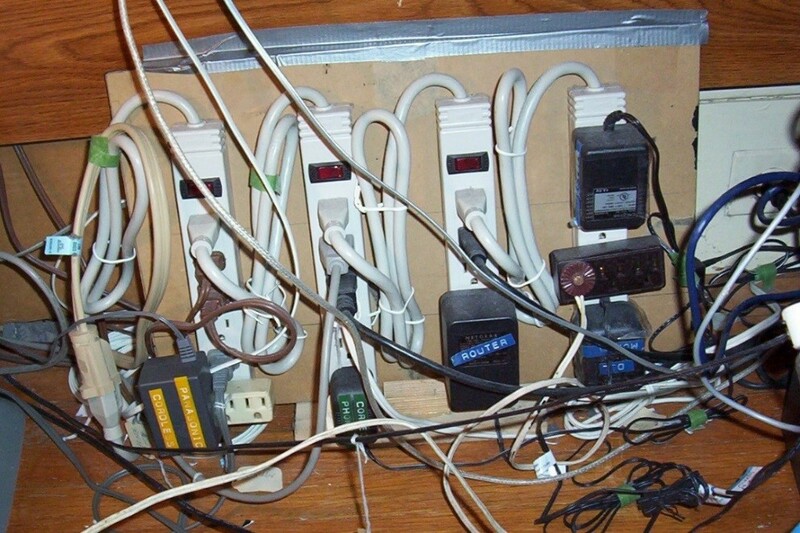 (pictured above: someone has adhered several power strips to a sheet of cardboard, a highly-combustible substance – hmm… it may be time for him to double down on homeowners insurance). 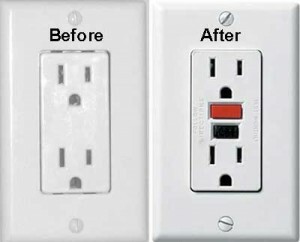 You have seen these before – they are the outlets which have a button between the two plug holes in a standard outlet. This is a safety device for an individual outlets or series of outlets. If this breaker is triggered, any electricity in that series is instantly shut off. The problem is that experts now believe that GFI protection should not rest on a series of electrical outlets, but rather each outlet should have its own GFI breaker. One outlet that is prone to surges will cause a string of outages if triggered. Having GFI protection on each outlet ensures that outages are local, specific, and will stop a dangerous power surge instantly. An older piece of advice was to use the bi-annual events of changing our clocks to remember to change the batteries in one’s smoke and carbon monoxide detectors. The only problem? I have never known someone who actually does this. Typically, it is only when one hears the annoying and screeching chirp of a detector informing the residents that the battery is dying before they take action. And by “take action,” I mean that one grabs a broom and smacks the detector until the battery falls out. There is a much safer and far less ear-splitting endeavor: wire those detectors. There are few devices that are more important in your home – a microwave likely cannot save your life and yet it is constantly plugged in, so wisdom would hold that alerts to smoke and carbon monoxide deserve at least as much respect. The essential question here is, “Would you bet your life that the batteries in your detectors are good?” Electrical pros like we have at Entek HVAC company can ensure that you never need to worry about this issue again. No one is questioning the expertise of your nephew and his quality of workmanship, but the wiring of large electrical units is extremely important for everyone’s safety. An improperly installed circuit board for a unit such as a hot tub is dangerous, not only for those who use it, but also for those who are installing the circuit board. The amperage on a large unit like a hot tub is much higher than a standard outlet and mistakes are less likely to result in a small shock and numb fingers. Important wiring is best left to the professionals of Entek HVAC Company. As the holiday season nears, heat, lighting, and electrical devices will be in increasing demand in your home. Christmas lights alone will add many more plugs to an overburdened power structure and it is critical that your electrical system is safe and efficient.